After the third day of school, I have a new category for choosing read alouds: Books That Work When Everyone is Hot and Sweaty. As you can probably guess, my school (which is charming in so many ways!) does not have air conditioning. I forget the implications of this until I'm actually in my classroom, faced with 23 little flushed faces. The first few weeks of school are the worst. When the fans are going, voices are lost in the hum of white noise. When they are turned off, everything is just still, moist, and humid. This complicates read aloud time. The wrong book choice can make everyone hotter and more miserable. Miss Rumphius, one of my favorites for cooler months, is torture to read during the hot weeks, as are other longer books. We need books that yield their secrets quickly. Which leads to the new category. Books that Work When Everyone Is Hot and Sweaty are books that transcend our momentary discomfort and help us to feel better. Usually they are short, interesting, and funny. Today's pick was Dr. Xargle's Book of Earthlets. While I read this aloud to two different classes, we were briefly transported beyond the 99% humidity and into a world of talking and sharing. In this book, the alien Dr. Xargle explains Earthlets (babies) to a class. The kids loved figuring out what Dr. Xargle was really talking about--for example, we worked our way through the way that Earthlets are born without fangs, and have to drink milk through a whole in their faces. No one complained through the entire twenty minutes, and the good feelings carried us through the rest of the class. Dr. Xargle was just the thing to perk us up and get us through another humid Friday afternoon. But Monday is approaching fast. Any new additions to the category of Books That Work When Everyone Is Hot and Sweaty? Please comment below. Twenty-three fourth graders are counting on you! Well! Two days down, and the students who were once just names on a page are now starting to become real people with real personalities. Things in the classroom are taking shape. Much of my time in the last two days has been spent in matching books to readers. It's a messy process, with some real issues to consider. One obstacle is just classroom management. I can't have 20 kids browsing simultaneously in my 20 square feet of classroom library space. Another obstacle is my lack of knowledge. Book selection is a personal affair, but I don't know my students very well at all. Here's how I deal with it. I divide and conquer. When the kids are out of the classroom, I use a crate and gather about 30 of my best chapter books at various levels. For beginning of the year fourth grader, I need a huge range: some Horrible Harry books, some Magic Treehouse books, a few by Andrew Clements, Clementine, Dragonslayers Academy, and Judy Moody. (Lots of series books here--they work wonders at the start of the school year!) At the upper end of the range, I toss in a few by Eva Ibbotson, some Hank Zipzer books, and some books by Dan Gutman. Then, I put out some of my best high-interest picture books on a shelf at the front of the room. Many of these books are familiar to my students, but I expect that some will want the comfort of a book that they know. Diary of a Worm is a favorite every year, as are the nonfiction books by Nicola Davies and anything by Jon Scieszka. To hand out books, I gather students at our read aloud area. We brainstorm some rules to remember for independent reading time. For our first two days, I didn't go heavily into reading strategies or comprehension. There is time enough for that later. Right now is the time for just sitting and reading. After a quick discussion of rules, I hold up books, one by one, and give a brief but supportive introduction. As I hold them up, I distribute them to students who indicate interest. As they get a book, they leave the area to go find a quiet reading spot. Slowly the group around me dwindles until I end up with The Five. Every class has The Five. These are the students who resist book recommendations because they are looking for The Very Best Book Ever Written. I don't know why there are always five of them. I can't pick them out at the beginning of the class. The Five include both boys and girls, talkative students and quiet ones, kids who want to please and kids who want to cause mischief. They are a diverse group. But now I can give them my full attention, because everyone else is reading. Two or three just need some more one on one attention. I ask, "What was the last book that you read that you liked?" and base my further recommendations on what they say. Sometimes I read aloud from a first page--"Listen to this!" --and then they'll take a book. Sometimes they'll ask for a particular author or series, some book that they enjoyed from the previous year. Once these students have taken their books to a quiet spot, I'm left with just two. The two who remain are the most challenging. They shake their heads at my suggestions, listen with patient resignation to my book descriptions. It would be easy to take their refusals personally. But I don't live and die by the first day. Sometimes I need to concede: "Maybe we won't find your favorite book right now. Let's find something that you can read for a little while." This is when the picture books are useful. They are short and non-threatening. We adjourn to the front of the room to look at the shelf of picture books. "This will be a quick read, but I think you'll enjoy it. Then we can talk more about what you like as a reader." I'll hand them out, the last students will take them, and suddenly, I've done it. The room is silent as everyone reads. This was my day. Getting books in the hands of kids--one of the only fun parts of the beginning of the year. Once you've found books, you can add them to your own book list, and then email or print the list. It looks like it has great promise for helping parents choose books for students--simply put in books that students have enjoyed, and then print out a list of suggestions. I gave it a whirl to see what it would give me. I like using "Fair Weather" by Richard Peck as a read aloud. It is a little harder than what my students can read on their own, and has delicious details about the late 1800s. One grade level easier than Fair Weather gave me 181 results. Some, like the American Girl book "Changes for Addy", are pretty obvious. But there were results that I would not have come up with on my own, like "Fire in the Hills" by Donna Jo Napoli. There are links that allow you to purchase the books that are offered by Scholastic, and it even tells which books are offered by the book clubs. Just three more days until my room is filled with students! I have a new way of thinking about being "ready". There is no magical ready moment. For the last several years, I have worked through August, trying to make things neat and tidy and perfect. And the first few days still hit me like a ton of bricks. Even worse, I had worked so hard ahead of time that I was exhausted and drained before my students even walked in the door. So, since I cannot be absolutely ready, I'm saving my strength. I'm saving my enthusiasm, my excitement, and my energy for my time with the students. This means that I won't have a tabbed binder of student names ready for the first day of school, won't have every student name written neatly on every folder, won't have an organized library. But I will have more emotional resources to learn names, play games, and eat lunch with my students. These are the things that will be more important in the long run. My students don't ever come to me and say, "I'm so glad that you have an organized tabbed binder with all of our names in it!" But they do say, "Could you eat lunch with us? I'm a little nervous about the first day." How will this approach work? I'll find out this week and report! Of course, I haven't stopped thinking about school. I've just decided to focus on doing what I like. And what I like is planning. We're doing found poems and sharing some poems together on the first day. On the second day, I'm going to introduce a set of point/counterpoint poems that I wrote last year and posted over on TeachersPayTeachers. These two poems showcase two opposing feelings about coming back to school. One speaker is excited and enthusiastic, while the other wishes for more weeks of summer. Kind of the way I'm feeling right now! I hope that this will generate some good discussion with the students, and maybe lead into us writing point/counterpoint poems together. Summersweet--one of three bushes in my yard with "sweet" in the name. (Sweetspire and sweetshrub are the other two.) Although it took me six years, I finally coaxed this native to bloom! This time last week, I was at Disney World with my family. This time next week, I'll be in the middle of my third day with students. What a change! The poems and cut out words are ready for Found Poetry. But now I have to figure out how the rest of the day will look. To do this, I'm thinking back to the best preparation for teaching I ever had--my days as a camp counselor. Because, for the first days of school, I need to think like a camp counselor. The emotional and social lives of my students will be foremost as we come together. This means getting myself prepared to do some things that teachers don't usually do--eating lunch with the students, planning extra recesses to practice routines, playing lots of games. But the time spent in all of these extras will have big payouts later in the year. Here are some of my favorite games for the first few days of school. They all have some common characteristics--they are quick to explain and easy to play. The more complex, longer games I save for a few more weeks. Train Wreck: Seat students in chairs in a circle. Have enough chairs for all of the participants except one. That person is in the center, and is the caller. The caller will make a statement, and everyone who fits that statement will have to find a new seat at least two seats away. (Examples: Everyone with long hair, everyone wearing shorts, everyone who has a sister.) The caller, of course, tries to take a seat, and the person who is left standing is the new caller. For the first day of school, I try to set it up so that students use descriptors that will teach us about the other students. And, of course, I explain that all descriptors must be positive! At "Train Wreck", everyone must find a new seat. It's fun, it's some movement, but it's not too crazy. The Blanket Game: This is a game made for rainy Sunday afternoons. I first learned it as a camper myself. It sounds simple, and it is! You will need two volunteers to hold a blanket, or tablecloth, or whatever you have, making a screen between two equal teams. At your signal, each team sends someone up to right beside the blanket. The holders lower the blanket, and the two contestants try to say the other's name as quickly as possible. The first one to correctly name the other is the winner, and the other student has to go join the other team. It's fun as the size of the teams goes back and forth, and students have a real reason for learning names. Zoom: This is from The First Six Weeks. You will need a timer. Students stand in a circle. Choose a student to be the start. At your signal, this student will turn to the right and say, "Zoom". The next student will pass the word to the right, and so on, going around and around the circle. The goal is to get the word back to the start as quickly as possible. This is great for team-building, because all members of the class are working on a common goal. Keep a poster with times to show progress! Once the class has gotten super fast (below 5 seconds is definitely possible), switch it up. What if they go to the left? Would the score be faster or slower? Why? This game is fun to play all through the first few months. Distraction: I made up this game as I was writing The Forest and the Trees, and it's described in the third chapter. It's based on a segment on the HBO show Crashbox, and is a great way to explain to kids that they are in charge of their attention. Choose a student to read a paragraph from an informational book. (For the first week of school, the school handbook is a great choice!) While the student does this, zoom around the classroom doing crazy things--making faces, jumping on a chair, whatever you can think of that will get the students' attention. Then, when the reader is finished, stop being silly and ask five questions based on the reading. The point is for the students to try to ignore your silly behaviors and focus on what is being read. After the first round, brainstorm strategies for paying attention, and try it again. Kids can improve quickly at this. Keep the list of strategies for paying attention and refer back to it when you start teaching meaningful lessons. My least favorite game: The one where you have to go around the circle, say your name, and an adjective that describes you, and then recite everyone who came before you. Played with twenty kids or more, this is an exercise in torture. Only one person is actually participating at a time, which leaves lots of down time for mischief. Too many Sunday afternoons of this game have led to my dislike for it! Any other favorite first week games? Share them! In the past few days, the Myers-Briggs personality quiz has been making its rounds through my friends and family on Facebook. After hearing us talk about the personality traits of all of the grown-ups in his life, my ten year old asked if he could take the test too. "Please, please, please?" he begged. "It looks like so much fun!" These quizzes are contagious, and with good reason. So then the question becomes--how can I use this in my classroom? In "The Forest and the Trees", I wrote a quiz to help young readers figure out what kind of reader they are. Simply put, efferent readers like to read to gather facts and information, while aesthetic readers read for the experience of being deep in a book. The quiz helps students to think about their preferences and understand what they like and why. Efferent readers prefer nonfiction books, books they can sink their teeth into; they can get frustrated with books that are all about feelings. And aesthetic readers (like me!) will focus so much on the inner lives of the characters and their feelings that sometimes they will lose track of plot details. After taking the quiz, one sixth grader exclaimed, "It's like they know everything about me!" I think this quiz will be a good choice for early October, once students are comfortable with independent reading routines. As a teacher, I look forward to seeing what the quizzes show, because it will help me to guide the students toward books they will enjoy. I can also help students understand how they can overcome their particular inclinations--for example, aesthetic readers like me will have to work a little harder to get the facts from a passage. What other quizzes have you found to use with students? Have you noticed how much they love to take these little tests? P.S. For those who know me: My Myers-Briggs is Introverted-Intuitive-Feeling-Perceiving. In the "Which Anne of Green Gables Character Are You?" quiz, I cheated so that I could come out as Anne. And, in "Which Kind of Dancer Are You? ", I was a ballerina. Big surprise. One of my favorite ways to start with reading instruction is to work with young readers on the topic of story elements. Why? When students can talk about characters, about events, about problems, and about themes, they are on the way to having engaging conversations about what they read. Starting out with story elements makes independent reading go so much more smoothly in the early months. I've found some great resources for teaching story elements. Since I've made the move to fourth grade, I've started looking more at fairy tales and folktales for these early months. Students can't resist these stories of magic and mystery. One new site is called Interactives. Students can see the story of Cinderella, and then see how the story elements fit together. What a great resource for students to use with parents, with tutors, and on their own! When we tell and retell stories, fourth graders need concrete manipulatives. I like to have students use figures or pictures for their retelling. Playmobil makes absolutely irresistible sets of little figures to use for retelling. Last year, I bought their Sleeping Princess set (really the story of Snow White.) When combined with a picture book of the story, it's an instant retelling center. I especially enjoy seeing boys find their way through the story...many of them did not know that the stepmother had tried to poison Snow White twice before she succeeded with the enchanted apple. They were so amazed to find that the poisoned kerchief was included in the set! Rumpelstiltskin by Paul Zelinsky. The illustrations are fascinating for the kids. Of course, this story gets kids questioning--what is the deal with the little man? Why does he want the queen's firstborn son? Great way to get kids thinking early in the year! The Twelve Dancing Princesses There are lots of versions of this floating about. With the new, deeper retelling by Jessica Day George, I'm hopeful that this book will get lots of kids reading. Weslandia by Paul Fleischman. Kids really enjoy this one, as it has such a neat problem and solution. It is also good for the start of the school year, as it helps us to have important conversations of what we want our classrooms to be. Today, as I was working in my classroom, putting away my books, I found some of my favorites...and I started to feel excited for the coming year! I was also playing around on my computer and I updated my Story Elements Powerpoint. I like to put some of my major teaching points for the whole group lesson on Powerpoint, so that, no matter what the distraction, I can be sure to teach my key content deeply, richly, and well. Five lucky readers were selected to receive a free set of Steve Jenkins books and a stuffed animals from Kohl's. The teachers are Nicole, Colleen, Sarah, Jesus, and Jean. Congratulations! The materials will be sent to your schools. For everyone else, don't forget that the Steve Jenkins books are still available at Kohl's. These books are great for the primary and intermediate classrooms, as they feature interesting text structures, high-interest text, and wonderful pictures. Check out the Comments from the original post to get more ideas for teaching them. Teaching text features is one of my first orders of business for a new school year. When students understand how to use headings, the table of contents, the glossary, and other features, it is easier for them to navigate nonfiction and find out what they want to know. One roadblock in my way is that kids don't know the word "features". Without this knowledge, they can't connect how features in text relate to other kinds of features. They have only one pathway to the text feature knowledge--which, as we know, leads to a poor representation of this idea in the brain. But my own personal children know all about features. How did they come by this knowledge? Well, I certainly didn't sit down and do a Frayer model with them! Rather, they learned about features by playing with toys. They have at least five different kinds of boats. What are the different features? Which ones are similar? Which ones are different? Using toys is a great motivator for kids of all ages. Bionicles, Playmobil, and other intricate toys can help kids to learn what features are. Kids can also learn about the features of the playground. What features make this playground interesting and unusual? What features do most playgrounds share? Once students can use the word "features" to describe concrete, real-life items, they are ready for learning about features in text. Just as we can look at a toy and describe its features, they can also look at text and identify the features that authors use to make that text easier to understand. Last week, we were lucky enough to spend several days at the beach. One of our favorite activities is to drive down to Assateague National Seashore and have a campfire in the evening. Assateague, of course, is known for its wild horses. Well, we started the campfire, looked for ghost crabs, and watched the sandpipers, but there was not a pony in sight. The sun set, a fiery ball to the west, and things started getting dark. Of course, my littlest wanted to leave, but we were enjoying the sounds of the ocean and the warmth of the campfire. Then, in the moonlight, we could see three ponies down the beach. "Look!" I told Aidan and Zachary. We peered down the beach. One veered up the beach toward the dunes. The other two continued toward us, coming closer and closer. And closer. As we sat on our beach chairs, they cantered down toward us. "Don't worry. They won't come too close," I told Aidan, who was huddled on my lap. Well, I was wrong. The two came right through our circle of chairs. The white one leaned down and sniffed my husband's head. He sat calmly, still holding the stick for roasting a marshmallow. "Get the camera!" I told my husband, but we realized that the camera was in the other bag, on the far side of the horses. So all we could do was watch. The other pony, brown and white, leaned down and smelled our bag of graham crackers and chocolate. Then she lifted her head and looked directly and Aidan and me. She took a step closer. What a moment! We sat quietly--okay, I was kind of frozen--and then she turned her head, snorted, and started walking back down the beach. A cloud of mosquitoes followed in their wake, breaking the spell of the moonlight and the horses. We tried to swat them away, put on more insect repellent, but it was futile. Hurriedly, we repacked our items and raced back toward the dunes. One of those evenings that I'll remember, long after my Monday evenings are overtaken by planning and Open Houses and schoolwork. Since I first discovered the fun of reading The Onion, I've enjoyed expository fiction. Even if you're not aware of the term (which I may have made up), you've probably read this kind of text. Expository fiction is written like an expository piece, but includes entirely made-up details. Kids enjoy this kind of text, too. It's even more fun when the expository fiction goes along with an interesting fiction text. For example, the authors of The Spiderwick Chronicles also wrote an "actual" field guide to the magical creatures. It has all of the conventions and features of a regular field guide--entries, habitat notes, captions, and the like--for all that it is completely made up. Readers can follow up with The Care and Feeding of Sprites. Written like a typical guide to pets, it tells kids how they can capture and keep sprites! More recently, DK Readers published Star Wars Epic Battles. From the outside, this looks like a regular DK Reader, the kind that might tell about vehicles, space travel, or interesting jobs. But on the inside, it explains various battles from Star Wars. And it uses a variety of text structures to do so, explaining how the battles were fought and won. I can see this as a book that will hook even the most reluctant reader. What can you do with expository fiction? For one thing, it's another great way to teach text features. As I read aloud the novels from the Spiderwick Chronicles to my students, they passed around the Field Guide to find pictures of the creatures that were mentioned. They quickly learned to use the Table of Contents to help them navigate through the book! Expository fiction also has great applications as a tool for helping students to write quality expository text. Writing a research report is a tough task for a young learner. Not only does she have to read and understand the new information, but she also has to put that information into an unfamiliar genre. Expository fiction relieves some of this pressure. Instead of having to learn and remember new information, the learner just has to make up some details. What fun! Kids can learn how to write cohesive paragraphs by putting together their own field guides to imaginary creatures, writing their own pet care guides to imaginary creatures, or making imaginary newspapers. I started using expository fiction with my sixth graders several years ago. Students created their own country, and then wrote a five-paragraph essay to describe the features of that country. It was a fun and interesting way to introduce expository writing. 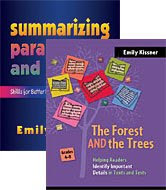 If you'd like to take a look, the entire unit is posted for free at TeacherPayTeachers.com. As July turns to August, I make a transition in my thinking. The upcoming school year slowly morphs from a vague idea into a specific reality. I have to go from the sun-soaked brainstorming of early summer--"Next year I'll do this, and this, and this!" --into the practical realities of what will and will not work with my students. For me, the hardest day to plan is the very first day. I don't know the students, and they don't know me. In four weeks, we will be a cohesive community, with our own jokes and culture and ways to spend time. But it's a challenge to get to that good place. This year, I'm going to tweak a Responsive Classrooms idea. I've had great luck with having students decorate the labels for different places in the room--the art supplies, the different closets, the pencil sharpener, the library, the dictionaries, and so forth. This gives students something meaningful to do right from the moment they walk into the room. I'm going to take this one step forward by moving from decorating the labels into decorating posters of poems that we'll be sharing this year. One poetry thought led to another. My mailbox has been filled with Back to School catalogs lately. Why not put those to good use by having students create found poems? To create a found poem, students just choose and arrange words from various sources in a new way. It works well to have a variety of words cut out ahead of time--a perfect task for a student who will be volunteering in my room right before school begins. After we talk about what a found poem is and I share an example, students choose their color of paper, and select and arrange the words. A back to school/autumn theme will work perfectly. Found poems can be funny and thoughtful. What makes them so much fun to do is that every kid can create an interesting product, and the word selection often leads to unexpected combinations. Sharing the poems will be a low-stress, funny way to get to know everyone and see what they can do. Here is a lesson on using found poems from ReadWriteThink.